Nakuru which was established as part of the White Highlands during the colonial era has flourished into a thriving cosmopolitan town. 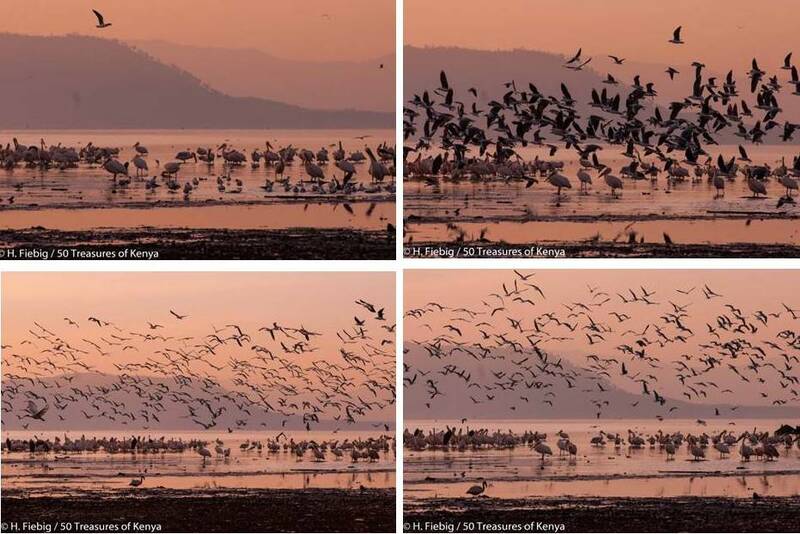 Situated about 160 km north of Nairobi, between the Lake Nakuru National Park which is renown for the sensational flamingo assemblies that visit its alkaline waters, and the colossal Menengai crater along with its combined volcanic landscapes. It is placed in an environmentally sensitive area which also boasts tremendous economic, cultural, scientific, and recreational value. The area surrounding the town is known for its vast agricultural potential and also serves as an important educational center which hosts a number of learning institutions. 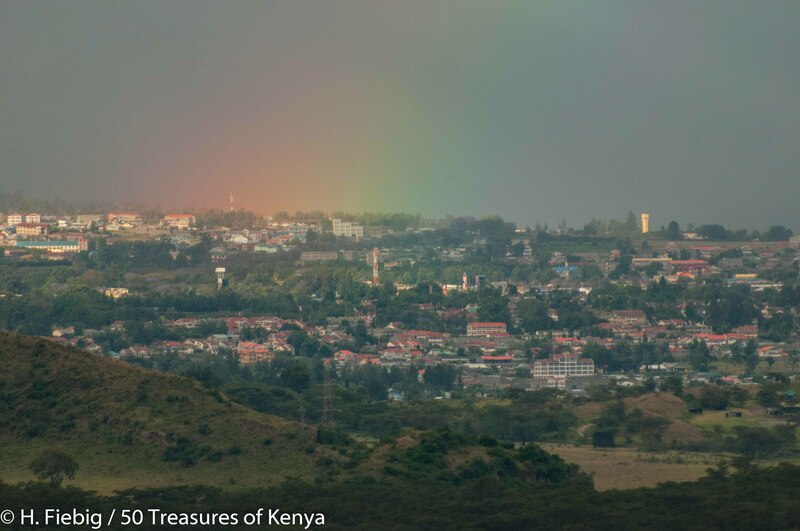 Rainbow over Lake Nakuru town. Nakuru, which still serves as an administrative capital in the Rift Valley, like many other places in the region also derives its name from the native Maasai. Formerly known as Nakurro or the ‘dusty place’, it first became a municipality in 1952 after it received its township status in 1904. Once dubbed “the cleanest town” in East-Africa, it is the fourth largest urban centre in the country after Nairobi, Mombasa and Kisumu. The town has also been ranked as Africa’s fastest growing town and the fourth in the world according to a UN study which was released in 2011. In addition, Nakuru is also a sister city of East Orange, New Jersey in the USA! 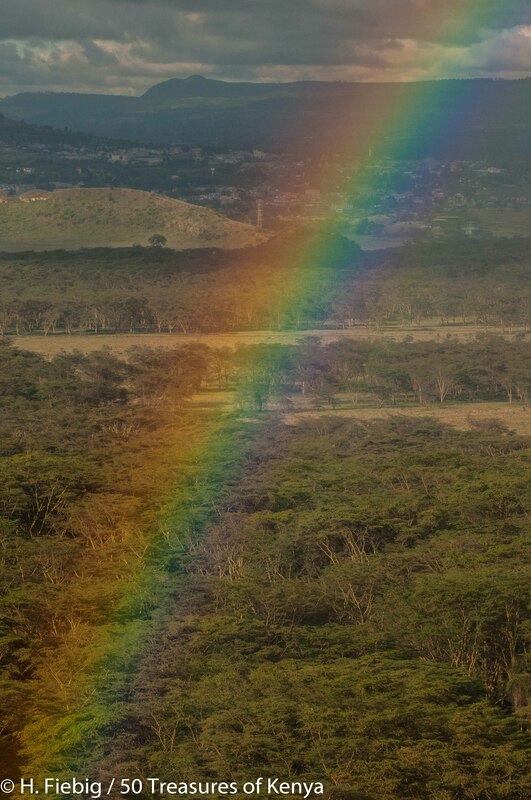 Rainbow over Lake Nakuru National Park. This shallow soda lake is a natural water catchment in the heart of the Kenyan Rift Valley situated near the southern edge of Nakuru town. 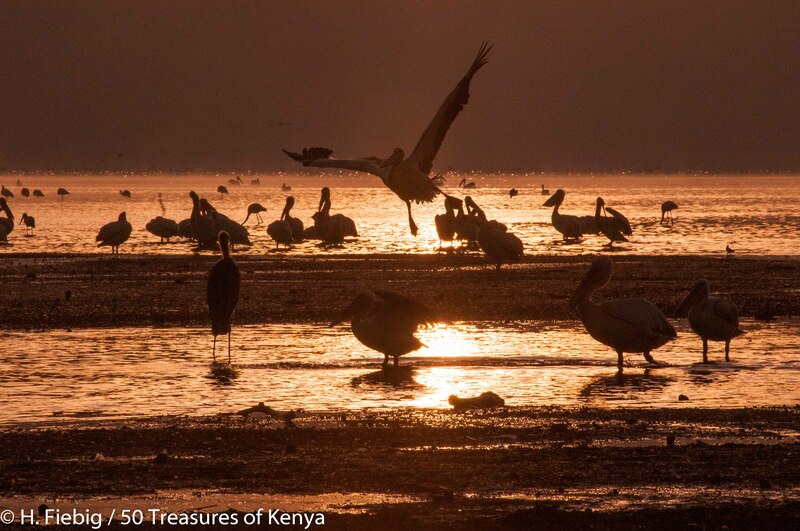 The Lake Nakuru National park is not only one of Kenya’s most treasured lakes but one of its premium parks as well. It is was first declared a conservation area in 1957 that only encompassed the famous lake and the surrounding mountainous vicinity before it was gazetted as a bird sanctuary in 1961 and later upgraded to National Park status in 1968. 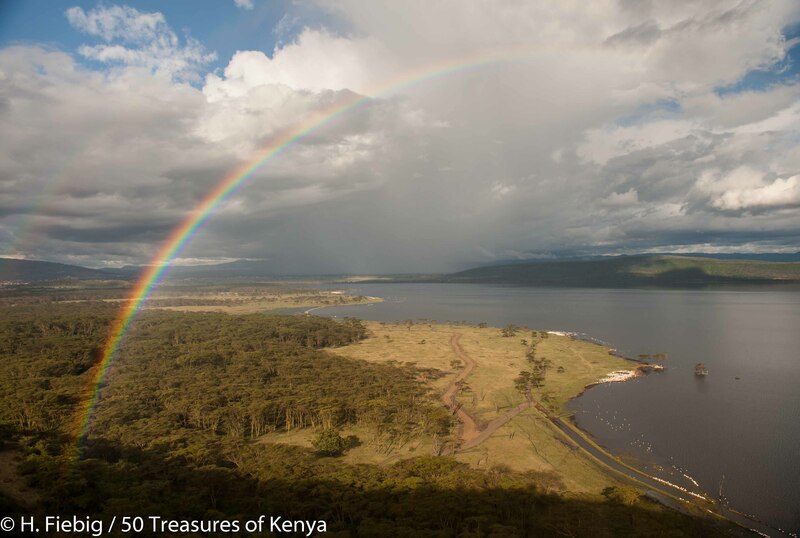 Rainbow over Lake Nakuru and the big fever tree forest on its Western shores. The park has since then been extended to include a large part of the savannahs. The northern extension was added to the park in 1974 and was subsequently designated as a Ramsar site in 1990 under the Ramsar Convention on wetlands. Named after the Iranian city, this international agreement caters to the conservation and sustainable utilization of wetlands around the world. It was later designated as an IBA (Important Bird Area) in 2009 before it became a World Heritage Site. 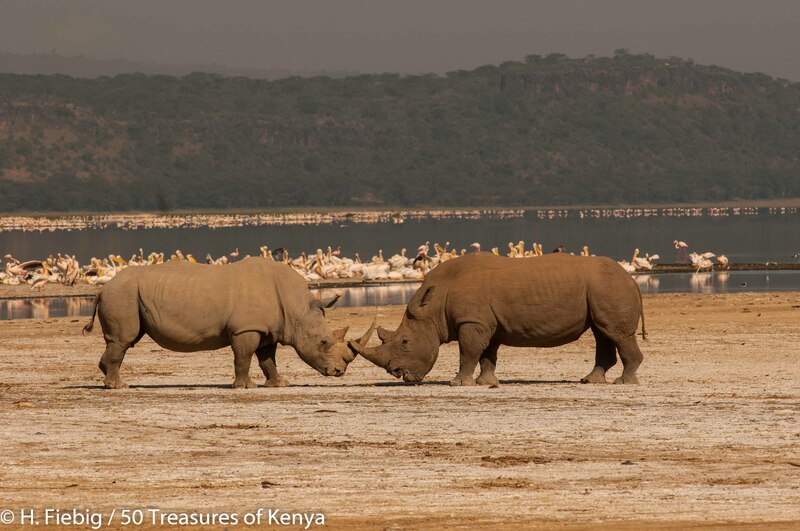 Lake Nakuru is the only fenced park in Kenya! 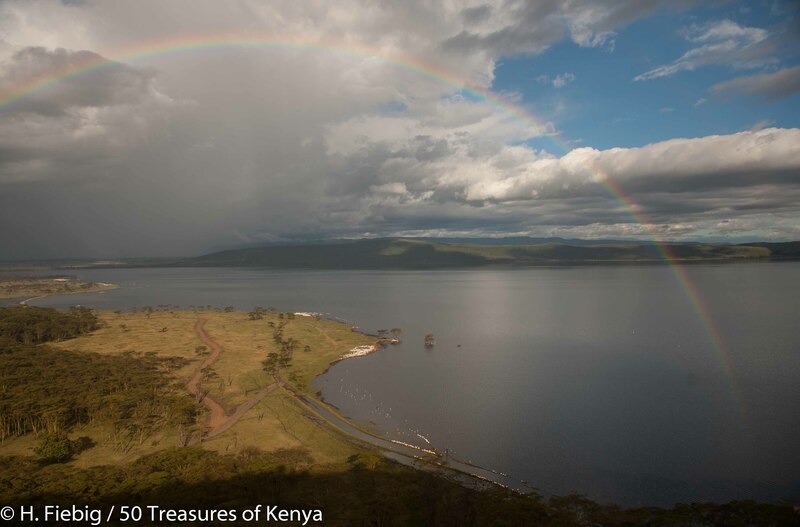 Formed eons ago during the huge depression of the Great Rift Valley, this shallow alkaline lake is set at an elevation of about 1750m above sea level and varies between 5 to 45Km2 . The landscape is a marvelous composition of marsh and grasslands that blend with rocky cliffs as well as outcrops and stretches of beautiful acacia woodland covered with the largest Euphorbia forest in Africa on the eastern side . The lake is fed by three main rivers, i.e. the Njoro, the Makalia and the Enderit as well as several other springs. Its level suffered a dramatic drop in the early 1990’s but has since largely recovered; usually receding during the dry season and then flooding during the wet season. The annual rainfall is about 965mm annually which is lower than many other parts of Kenya and the wettest months are between March to May and October to December, but even at these times it is not as rainy as other areas. 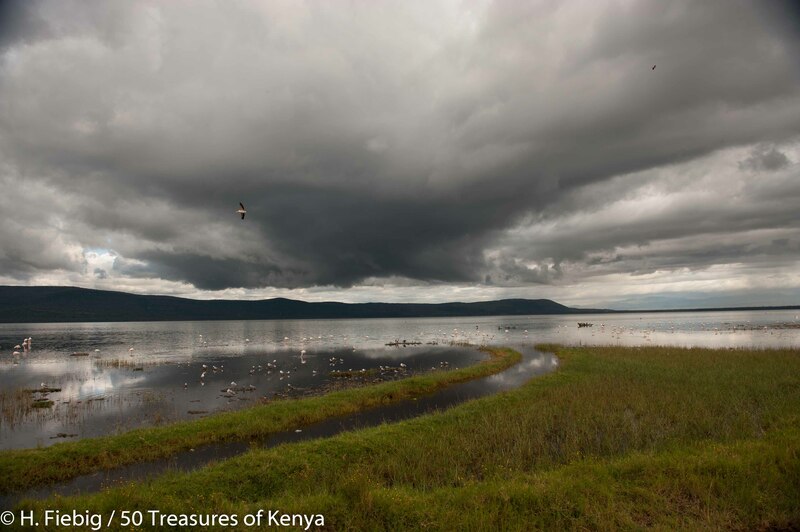 refreshing clouds over Lake Nakuru. The climate around the lake ranges from cool to hot and humid with some believing that the occasional drying up of the lake is part of a natural cycle since the last good rain seasons during the El Nino in1997 and the months of Oct-Nov 2002-2003. The best months to visit are June to September and January to March. 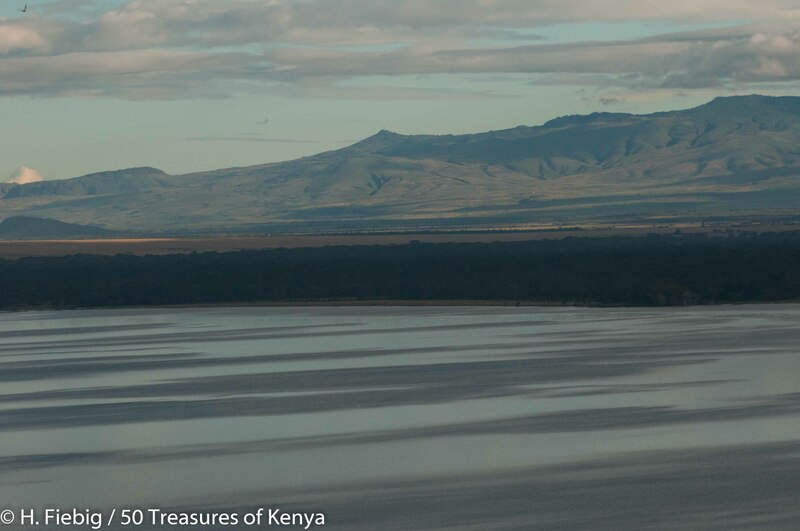 Lake Nakuru’s dramatic and picturesque panorama. The park was recently enlarged partly to provide the sanctuary for the endangered rhinos making the park the first national rhino sanctuary in the country in addition to the 188 km area around the lake which has been fenced off as a sanctuary to protect Rothschild giraffes. This is a security measure that ensures poachers are kept out rather than to restrict the movement of its wildlife. 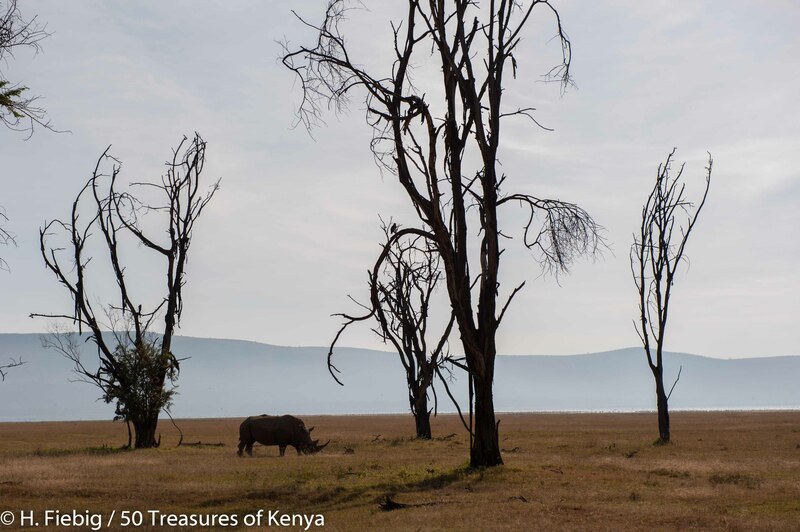 White rhino under dead trees, Lake Nakuru National Park. The lake is world famous as the location of the greatest bird spectacle on earth hosting myriads of fuchsia pink flamingos whose numbers are countless, often to the tune of a million – or even two million who feed on the abundant algae. Interestingly the algae, the blue green Cyanophyte Spirulina which thrive in the lake’s warm waters are created from their droppings mixing in the warm alkaline waters and plankton! 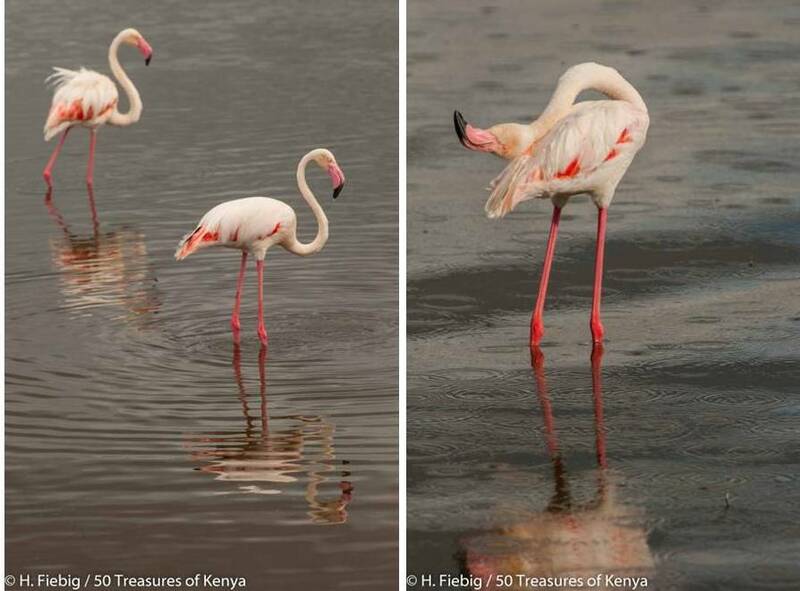 Their daily need been only 150 grammes per bird per day, scientists reckon that the entire flamingo population on the lake consumes almost 300,000 kg of algae per hectare of surface area per year! The Lesser Flamingo which are commonly featured in documentaries due to their vast numbers are distinguished by their deep red carmine bill and pink plumage in contrast to the Greater flamingo which has a black tipped bill. The Greater on the other hand also feeds on shrimps and small fish unlike the Lesser’s algae loaded diet. Some avian attractions also present in the lake are pelicans and cormorants which are two of the other large fish eating birds. Cormorans drying their wings after hunting for fish. 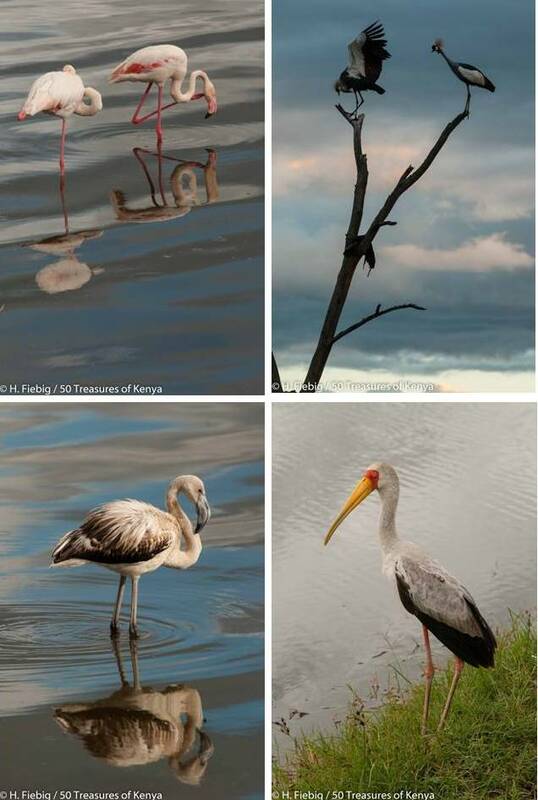 There are a myriad of over 400 other resident bird species that are hosted in the lake and the surrounding areas which include numerous big birds such as the African fish eagle, verreaux eagle, Goliath heron, Kingfisher and Hamerkop. Thousands of other waders and some palearctic species also make temporary stop-overs at the park. White pelicans can be seen at the southern end of the lake where they feed on Tilapia grahami, an alkaline-tolerant fish reintroduced into the lake like the (oreochromis alcalicus platensis) in the 1960s to fight against mosquitoes and increase the population of secondary consumers like the pelicans. The pelican’s maintain small groups in a horseshoe formation on the water to surround and force fish into shallow water, flapping their wings and plunging their bills into the water to catch the fish along their way. Pelicans can also be observed at the north-eastern shore of the lake where they usually come to wash and dry their wings. The number of animals encountered in the park is hardly negligible due to its small area and game density. Some of those that were reintroduced into the park include endangered browsers like the black rhinoceros which has a concave back and a triangular predatory lip specially designed to eat foliage on trees and shoots whereas the white rhinoceros has a wide flat snout suitable for grazing. 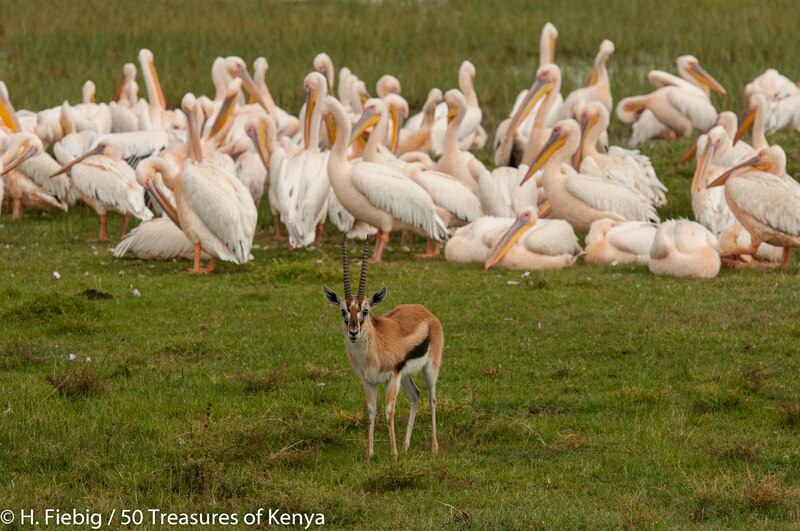 Lake Nakuru National Park also offers sanctuary to huge numbers of native African animals including water-bucks, warthogs, impalas and buffalo. A large herd of hippos have a territory in the northern part of the lake which makes for even more engaging game viewing. Other indigenous mammals seen in the park’s high grasses which border the shore include rock hyrax, bat-eared fox, wildcat, golden cat, Bohor reedbuck and Colobus monkey. The park can’t support African Elephants since it was fenced to protect endangered Rhinos and Giraffes, so you won’t find any here. 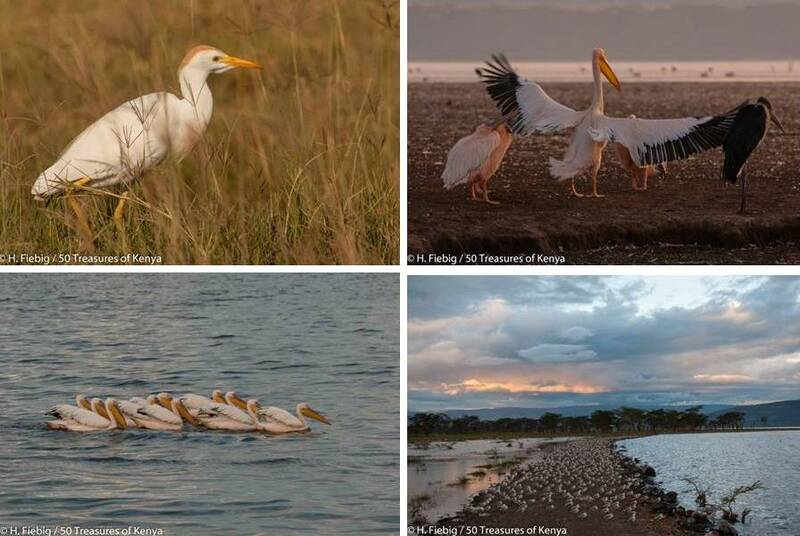 Lake Nakuru is relatively close to other treasures like Aberdares, Hells Gate and Lake Bogoria making it a perfect one day stop over or part of a circuit through Masai Mara and Samburu land. Its shores and waters yield some of the most pleasantly beautiful images in the continent; going beyond the lake through the forests up the hills down the waterfalls that are found here is always a rewarding experience. Baptized as ‘the greatest spectacle on earth’ due to the millions of fuchsia-pink flamingo that flock to feed on the teeming algae in its alkaline waters, the lake is also a popular ornithologist’s paradise. The number of birds fluctuates at times so you should always check with the national park if possible before making a long journey to view the birds. It is also a good idea to take a spotter’s guide with you to help you identify the many animals and Kenya birds you will see here. The lake is highly saline, so it is surrounded by a grassland of highly adaptable alkaline grasses from grasslands to dense forests comprised of very rare tarconanthus bushlands and huge euphorbia forests. Some of the fascinating volcanic backdrops include the Menengai Crater to its North, the Bahati hills at the North-East and the Lion Hill at its East. Another scenic feature is the Eburu crater, a much smaller crater which is located at its South and the famous Mau escarpment at its West. 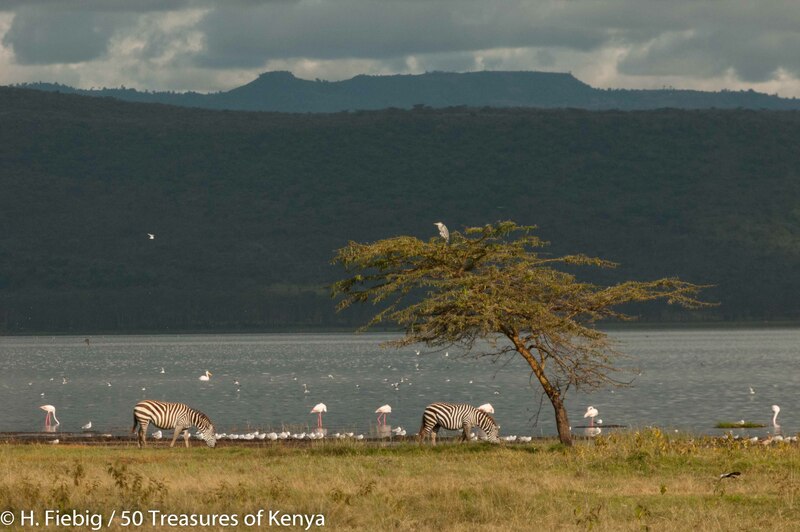 Zebras on Lake Nakuru, in the backdrop Lion Hill and the Eastern rims of the Rift valley escarpment. The parks fencing is indeed a very favorable installation which ensures that you always enjoy the wildlife even during the wet months because they cannot migrate from the park. 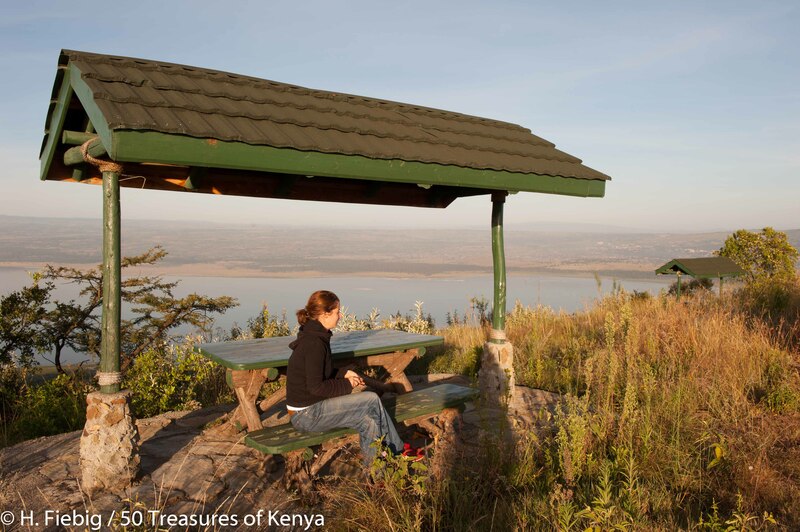 The Park entrance is about 6 kms from the town centre of Nakuru. As in most national parks, you must be in a vehicle. Walking is not permitted so you’ll either have to hitch a ride with other visitors or rent your own vehicle. You can only get out of your vehicle on the lake shore and at certain viewpoints. There is one main road which goes around the shore which is bordered to the east and the west by ancient forests and woodlands.The park has very good roads and some wonderful viewpoints overlooking the lake. Driving on the top ridge of Lion Hill. 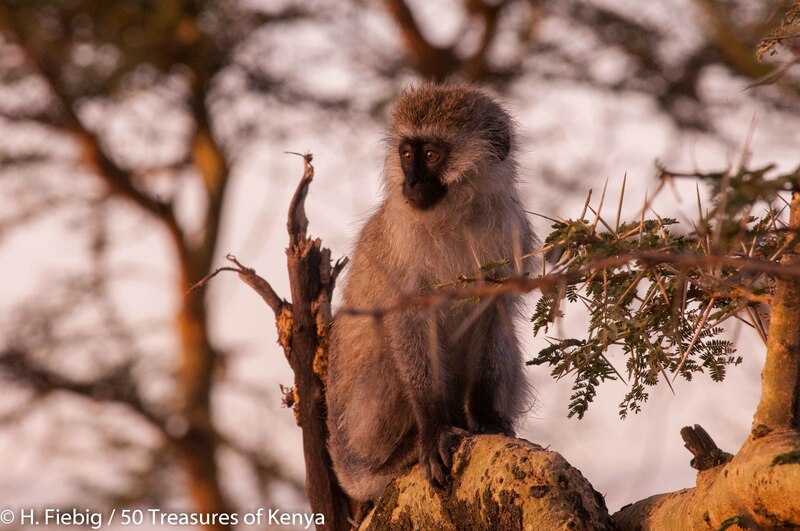 The best place to view the birds is from Baboon Cliff, where you get an excellent view over the lake and the wonderful spectacles along its edge. Picnic spot on Lion Hill. You can also visit some great picnic sites at the Baboon Cliff, the Out of Africa Hill and Acacia picnic sites for great panoramic views of the scenery around the lake. The Park offers a pleasurable to drive around its perimeter due to its easy to follow topography, good roads and clear signposting. It is highly advised however that you do not drive to close to the lake as the shore, a wet greyish ash powder, is very soft which makes it very easy for vehicles to get stuck. Carry plenty of drinking water, picnic items and camping equipment if you intend to stay overnight. Also useful are binoculars, camera, hat, sunscreen, sunglasses and guidebooks. 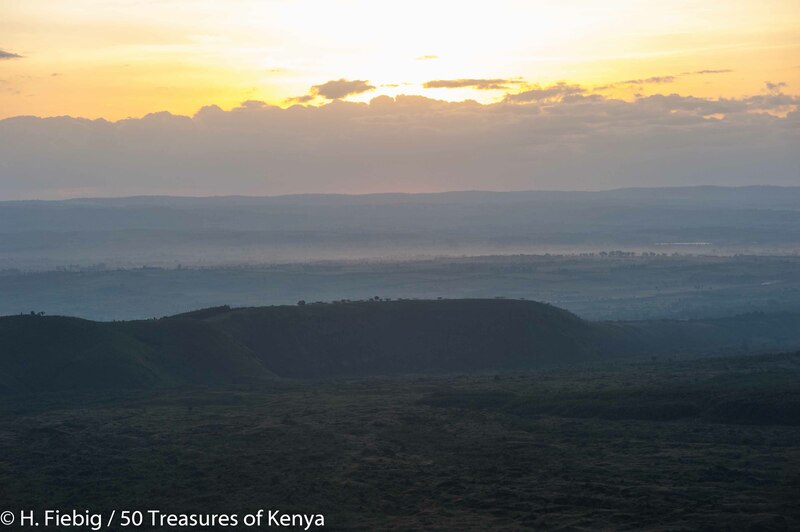 It is located 10 km north of Nakuru and is also accesible by foot or vehicle 8 km from the main road to Nyahururu. This extinct volcano is approximately 12km wide and drops almost 500m down from the top of its rim making it the second biggest crater in the world! It offers excellent hiking opportunity with scenic site comprised of hot springs and geysers. View into Menengai Crater at sunset. Menengai which actually means ‘the dead’ in Maasai is believed to have been an ancient native battlfield where many of the warriors were cast into. It is also know as ‘kirima kia Ngoma‘ meaning the ‘mountain of devils’ in Kikuyu in the language. According to folklore, the sounds which emanate from the the crater are of the souls that purportedly perished here during the battles. Many curious visitors are usually enthralled by an infamous cave within the crater due to it eerie reputation as a haunted place. Some of locals still believe that the evil spirits in the area captured the living and hid them indefinitely in the netherworld. People have been reported to vanish without trace; going missing for ages without recollections of what had happened to them. 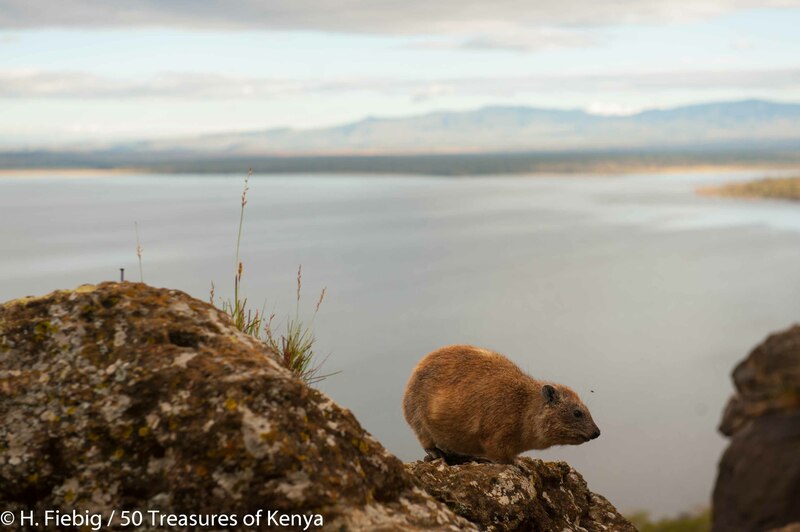 It is recognized as another important location which is situated to the South of Lake Nakuru which is an area of over 80 km2 of untouched forest in one of the twenty-two forest blocks in the expansive Mau range. Mt. 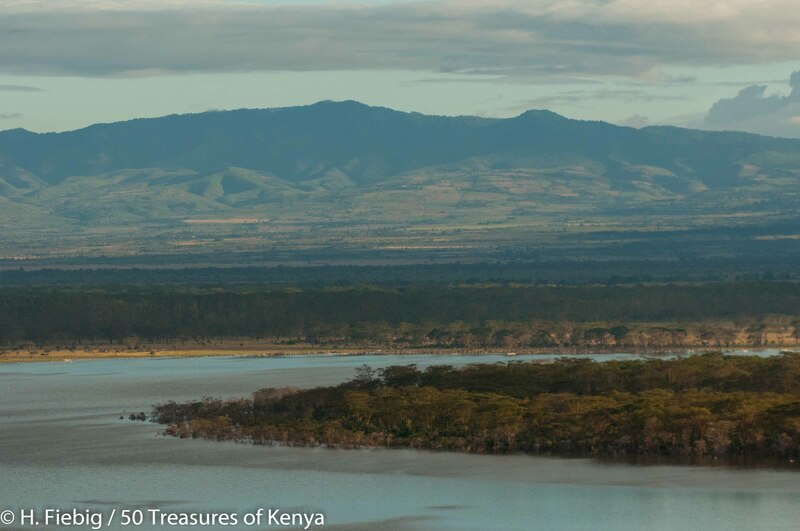 Eburru raises in the South of Lake Nakuru National Park. Illegal loggers hugely infiltrate this vicinity but the forest edge communities are already trying to conserve its water catchment and indigenous forest. 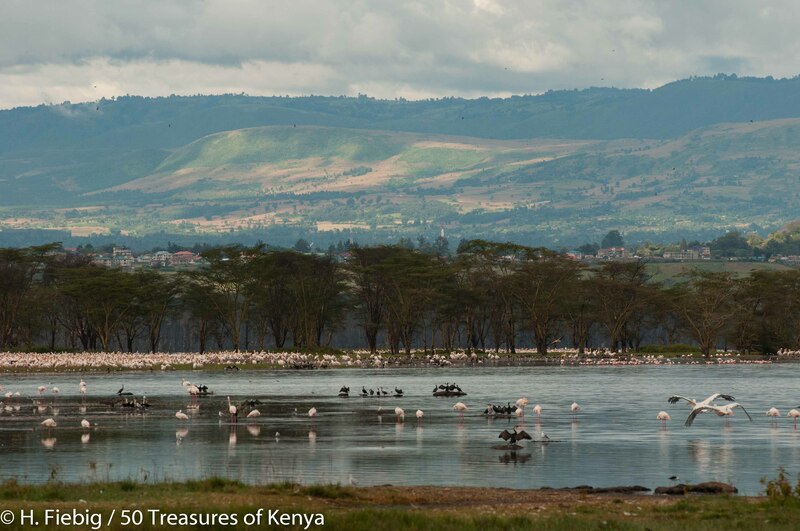 Other key scenic attractions include; hot springs, pelican breeding site and the fresh water underground springs inlet that is believed to emanate from Lake Naivasha itself. At the southern end of the lake lie the “Kekopey” hot springs, in which the Tilapia grahami breed. Despite the tepid and alkaline waters, a diminutive fish, Tilapia grahami has flourished after being introduced in the early 1960s. 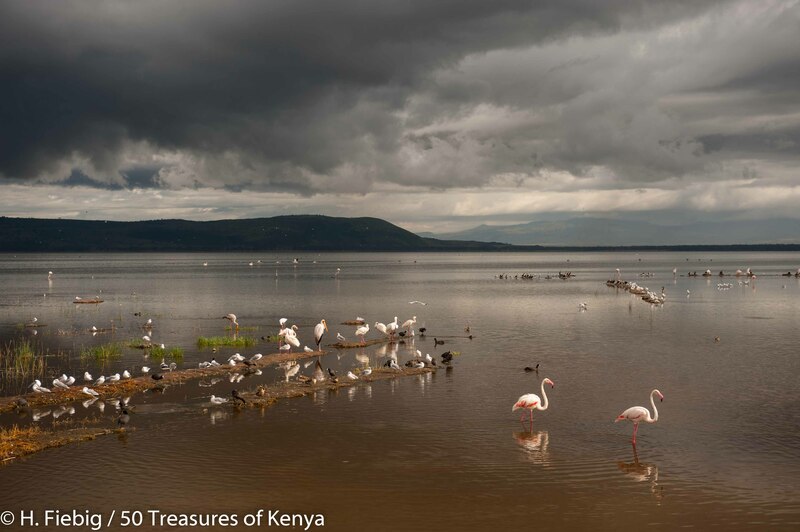 Once united to Lake Nakuru forming a much larger lake, Lake Elementeita, also spelled Elementaita, is another beautiful soda lake in the Great Rift Valley. Elementeita is also derived from the Maasai word, muteita meaning “dust place”, like Nakuru in reference to the dryness and dust in the area especially between January and March. 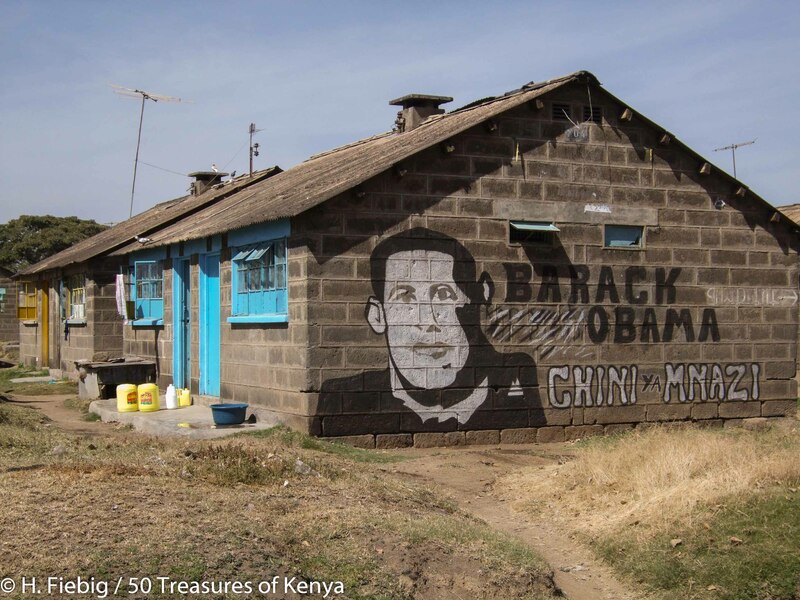 Located some 130 km from Nairobi, between Lake Nakuru and L. Naivasha. 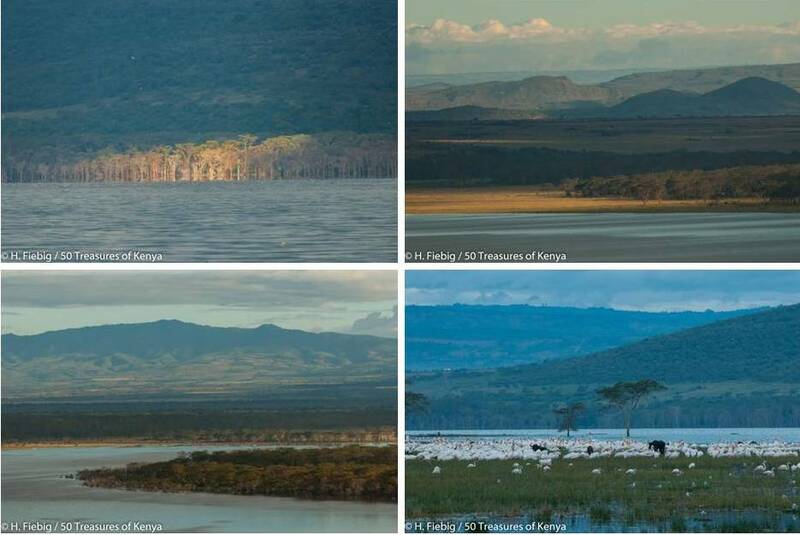 The lake is Kenya’s latest Ramsar site having attained the status in 2005 and also another prestigious UNESCO World Heritage Site. Standing at an altitude of 1775 – 1959 meters above sea level, this unique soda lake fluctuates between 19 and 22km2 which offer visitors the opportunity to walk very close to the famed flamingos, pelicans and other water bird life. It is a sanctuary for over a dozen threatened bird species and home to the highest bird diversities in the world. Supporting over 450 bird species that include approximately 80 waterfowl species; it regularly hosts migrant waders and other migratory birds such as the Eurasian Marsh Harriers when they stopover during their migration. Some of the bird species you’ll see are the ubiquitous flamingos, pelicans and an assortment of other water birds such as ducks, geese, spikes, cormorant. The wildlife around the lake include; buffaloes, zebras, Grants and Thompsons gazelles, Sykes monkeys, waterbucks, warthogs among others. Lake Elmenteita area saw its first white settlement when Lord Delamere established his Soysambu, a 48,000-acre ranch, on the western side of the lake. He later gave the land nearest the lake to his brother-in-law, the Honorable Galbraith Lowry Egerton Cole, part of whose “Kekopey Ranch”, where he is buried, is preserved today as the Lake Elementaita Lodge. Visitors can stay at the nearby Lake Elementaita Lodge, Flamingo Camp, Delamere Tented Camp, Pink Redman Camp or View Point Camp site. The local community has been setting up a campsite on the shores of the lake that will offer a unique accommodation experience for entusiastic ecotourists. So named from the massai word ol-corro which means ‘spring’ is a well know agricultural town 18 km west south west of Nakuru Kenya that is situated set in the foothills of the Mau above Lake Nakuru, on the western rim of the Rift Valley.It was Lord Delamere’s (1870-1931) desire to turn Njoro into the capital of the Kenya/Uganda Protectorate in 1904.The hunter turned farmer was on of the most influential British settlers in Kenya who’ s ambition was to develop Kenya’s agricultural economy. Later on in the 1920’s a sporting associate of Delamere, Lord Egerton of Tatton also decided to settle in the Kenya Colony, purchasing vast tracts of farming land before he created an agricultural school next door to Delameres plant breeding center. Lord Egerton’s School of Agriculture has since then it has developed to the fully fledged Egerton University. His old residence, Egerton Castle, has recently been renovated by the University to set up as a promising Museum of Agriculture. 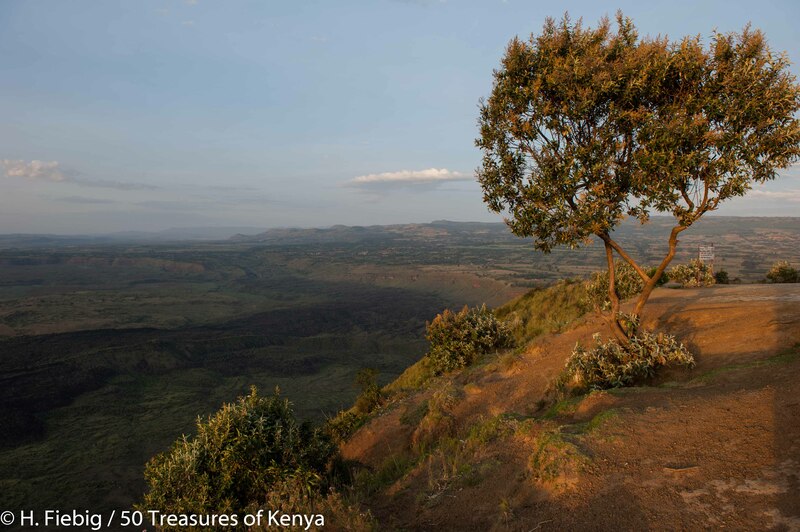 Old settler houses that once graced the area are still spotted around the area and visitors can find refreshment within the bounds of Lord Delamere’s El Dorado Ranch or at the Kembu Cottages and Campsite are which are also set up on the slopes of the Mau. Lord Delamere was the pioneer of the East African industry and the first European to start a maize farm. At Lanet, not very far from Lake Nakuru, is the Kariandusi Museum. It is another important prehistoric site, gazetted as a National Monument in 1943, where stone handaxes and cleavers were discovered in 1929 by Louis Leakey. It is studded with rocks and named after the numerous hyraxes that have made the hill their home. The museum, which contains artefacts from the site, was previously a farmhouse donated by the Late Mr. A. Salfe. It was discovered and first investigated by the Leakeys in the 1920s for its prehistoric value with seasonal human settlements and remains dating back to 3000 years. Nakuru town experiences a cool and hospitable climate. The dry season is from June-February with rains arriving from March-May and the best time to visit here is from June-September. There are several matatu stages to Nakuru in Nairobi which are all located near River Road. If you’re traveling from Nairobi west past Nakuru, you may need to break the trip up by first going to Nakuru, then getting another vehicle to your final destination. There’s only one major bus and matatu stage in Nakuru at the Eastern end of the town, off of Mburu Gichua Rd. The stage normally chaotic, but you will attract several touts who will gladly drag you to the vehicle you want. From the Nakuru stage you can get vehicles to Nairobi, Naivasha, Nyahururu, Nyeri, Eldoret, Kericho Kisii, Kisumu, and many other towns and cities. The newly introduced “Prestige Shuttle” on the Nakuru-Nairobi Molo line is an excellent choice. For only 50 KSh more, this matatu shuttle offers more comfortable seat and rides. Mololine, Crossroads and other matatu operators offer 9 seater and 14 seater matatu services from Nairobi. Mololine is known for its excellent service and security. The large bus companies including Kampala Coach and Busways all have Nairobi to Kampala coaches which also stop in Nakuru. There are no scheduled flights to Nakuru and visitors have to fly to Nairobi and connect to Nakuru by road. There are however daily scheduled flights with Air Kenya, Kenya Airways and Jet link from Nairobi, Mombasa and Malindi to Nairobi. The Naishi airstrip which services the park for tourism and KWS activities is also another option. The park has a tarmac road connection with Nairobi, a distance of 156 km North West of Nairobi on the main A104 road. 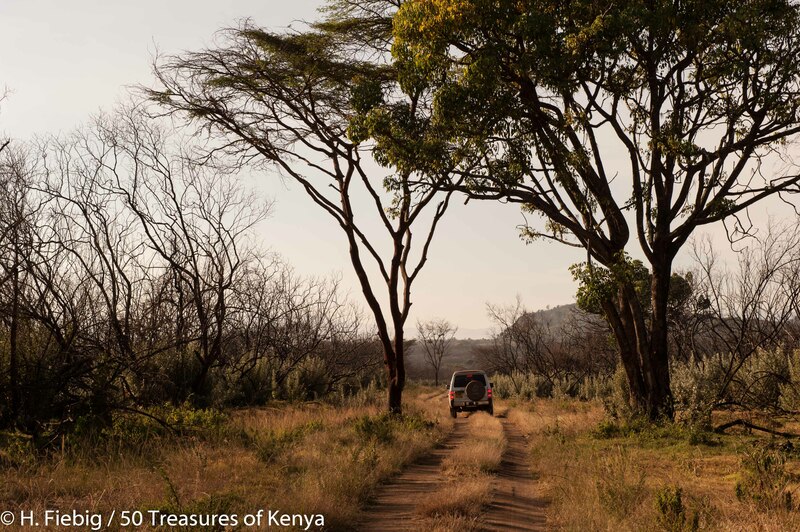 The most commonly used route into the park is via the main gate, 4 km from Nakuru Town Centre. It is also possible to enter the park from the main Nairobi Nakuru road at Lanet Gate. The park has an adequate and well serviced motorable roads that make most parts of the park accessible. Its opening hours are from 9:30 a.m-6:00 pm Monday-Sunday including public holidays. Numerous other accommodations can be found in Nakuru town and others which are located up to 20-32Kms from the National park include Merica Hotel, Lake Elementaita Serena Camp, Kigio Wildlife Camp and Malewa Wildlife Lodge Gilgil. One Sarova Lion Hill Lodge is a natural haven for bird life and attracts over 50 species of birds amongst the 400 species that inhabit the Par. It is cleverly laid out in such a way that most rooms and sitting areas afford stunning views of the lake and the park. The Lodge incorporates natural landscaping with tall acacia trees, winding walkways and greens flecked with bird feeds. Naishi House, a scenically placed twin-gabled house, is set amongst acacia trees with magnificent views of the Park. Its facilities include a fully equipped kitchen, dining room, sitting room, two bedrooms each with a king-size bed and single bed, bathroom and outside terrace. There is a caretaker at hand who will attend to your bedding, hot water and kerosene lighting. Private game drives in the company of a KWS Ranger can also be arranged and reservations can be made through the warden or KWS Headquarters in Nairobi. The Park offers two public campsites, Makalia and Backpakers, anlong with seven ‘special’ or private campsites. The ‘special’ campsites i.e. Naishi, Chui, Rhino, Soysambu, Nyati, Nyuki and reedbuck which have no facilities must be booked in advance on an exclusive use basis. The reservations can also be made through the Warden or KWS Headquarters. Like us on Facebook, Follow us on Twitter and stay posted for the next Treasure. Its always a pleasure to share a treasure.